Recently I got to try some sweet free Bob’s Red Mill Gluten Free Pie Crust, courtesy of Burst Media. Getting paid to try out food is pretty rad but please note, all opinions are my own. 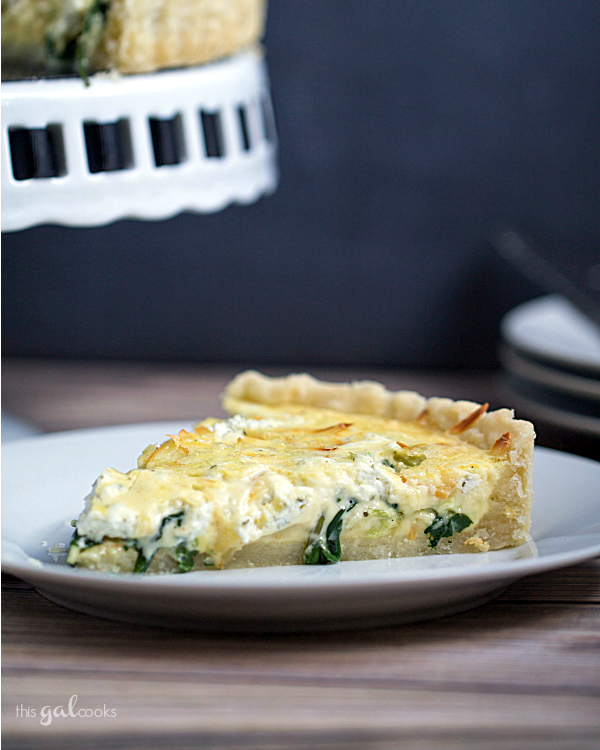 Breakfast, lunch or even dinner is served with this Spinach, Leek and Goat Cheese Tart! It’s made with Bob’s Red Mill Gluten Free Pie Crust so you’re gluten and wheat free friends can enjoy it too! I love making tarts, quiches and pies. But I don’t like making pie dough. Seriously, pie dough hates me. The few times I’ve tried making it from scratch has been a failure. When I do make any type of recipe that requires pie crust, I always buy pre-packaged pie crust. It’s quick and easy but the stuff I buy often has additives in it. And it isn’t gluten free. Now I am not a person who has issues with gluten but I like to cut wheat from my diet from time to time. And I like to make recipes that those who cannot eat gluten can enjoy. Recently I was presented the opportunity to try Bob’s Red Mill Gluten Free Pie Crust. I was pretty excited about this opportunity because I like trying out new products (in this case, a new to me product) and I know Bob’s Red Mill products are made with quality, healthy ingredients. I’ve tried many of their products including the gluten free cornmeal, gluten free rolled oats, gluten free oat flour and the quinoa. I decided to make a savory dish with my pie crust. Spinach, leek and goat cheese seemed perfect. And it was! I started out by prepping the Bob’s Red Mill Gluten Free Pie Crust dough. A package of the pie crust mix will prepare two 9 inch crusts. All you do is put the mix in a mixing bowl or food processor, add butter and/or shortening, some water and then either pulsate in your food processor or blend with a pastry blender. Once the dough is blended, halve and shape into two discs. Wrap in plastic wrap and refrigerate for one hour. After removing the dough from the refrigerator, I had to let it sit out until it was room temp to be able to roll it out without it crumbling apart. You’ll want to blind bake the crust before filling it. After blind baking, I filled my crust with smoked Gruyere cheese, sauteed spinach and leeks, goat cheese and an egg/cream mixture. I baked it at 350 for 25 minutes and then had a fantastic lunch! Freeze your pie crust for 30 minutes. After freezing, blind bake at 375 for 20 minutes. To blind bake. place a piece of parchment paper over the crust. Place rice or dried beans on top of the parchment paper to weigh it down. This will prevent your crust from shrinking while baking. Remove from oven after baking. Melt the butter in a large skillet or pot. Add the leeks and cook until tender. Add the spinach and cook until wilted. Drain if necessary. Whisk together the eggs, seasoned salt and pepper, nutmeg and cream. 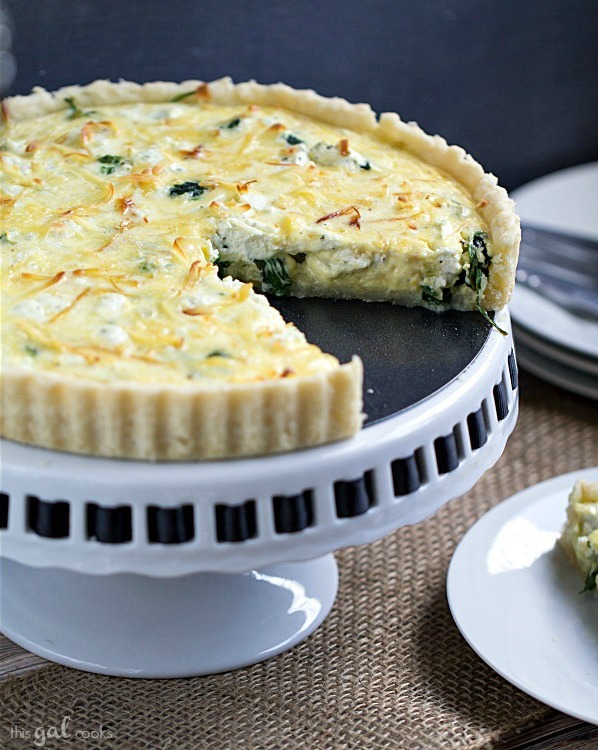 To assemble the tart, sprinkle ½ of the Gruyere cheese over the pie crust. Top with the spinach/leek mixture, green onion and goat cheese. Pour the egg mixture over top and then top with the remaining Gruyere cheese. Place your tart pan on a baking pan to prevent anything from leaking onto the bottom of your oven. Bake at 350 for 20-25 minutes or until the tart is just set. I love using leeks! They pair so nicely with goat cheese too. Your crust is perfect! This is one good looking savory pie Julie! Thank you so much, Tanya! This was actually the first time I tried goat cheese. It was pretty good! Now I did use the herb goat cheese so I’m not sure how the plain would be but I like the herb cheese! This tart has everything I love!! I wish you posted this recipe last week when I was wanting to use leftover leeks. I’ll need to make this tart ASAP! Plus, I LOVE Bob’s Red Mill Products!! I just bought their coconut flour and it’s AMAZING!! Pinned to my Favorite Foods board! I love Bob’s Red Mill products, use them all the time~! Pinned. 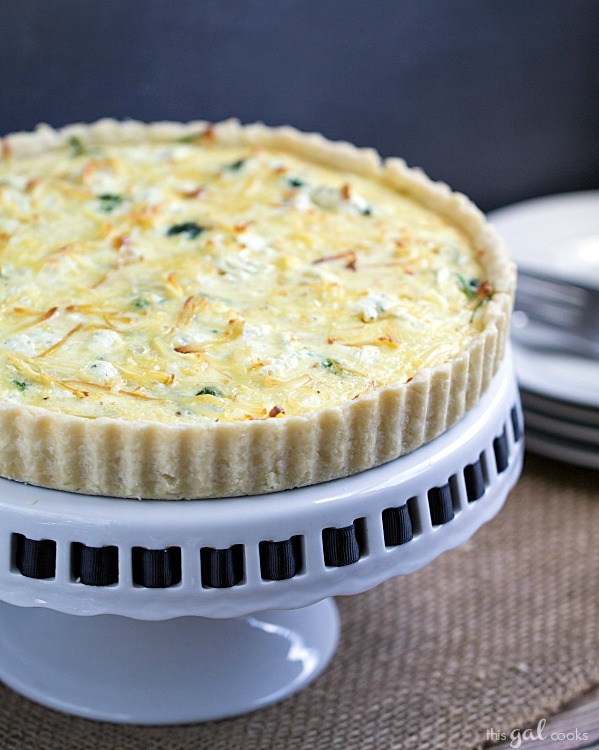 This savory tart looks wonderful Julie! Perfect for a brunch! Ricotta would be good! You could mix in fresh herbs with the ricotta to the the herbed cheese! Thanks for pinning and tweeting, Carrie! This looks SO good!!! I want to stop by and have some for lunch! :) Always great to find a good gluten free crust!! I pinned! What a great recipe, Julie! Your crust is so perfect! I need to get a pan like that. Sounds divine~putting it on my to do list, thanks! Wow Julie! This is totally my kind of tart. Loving the combinations of all the flavors. I have never cooked with leeks before but totally need to try it because I’ve heard there awesome! Great recipe girl, pinning! Julie, This would be perfect for a holiday brunch. Thanks for sharing this recipe. This looks great Julie and I like that the crust is gluten free. I will definitely have to try it! Thank you, Alyssa! This is a good GF crust. It doesn’t have any weird after taste like other GF products I’ve tried. Thanks for stopping by! Gruyere and goat cheese are favorites of mine. I bet it doesn’t even taste gluten free with all of that flavor. My mouth is watering. I love a good quiche! This looks amazing. Stopping by from the Will Cook for Smiles Link Up. Thanks for sharing :) Have a great Sunday. Hi, your all recipes are awesome I will try at home thanks for sharing the recipe.